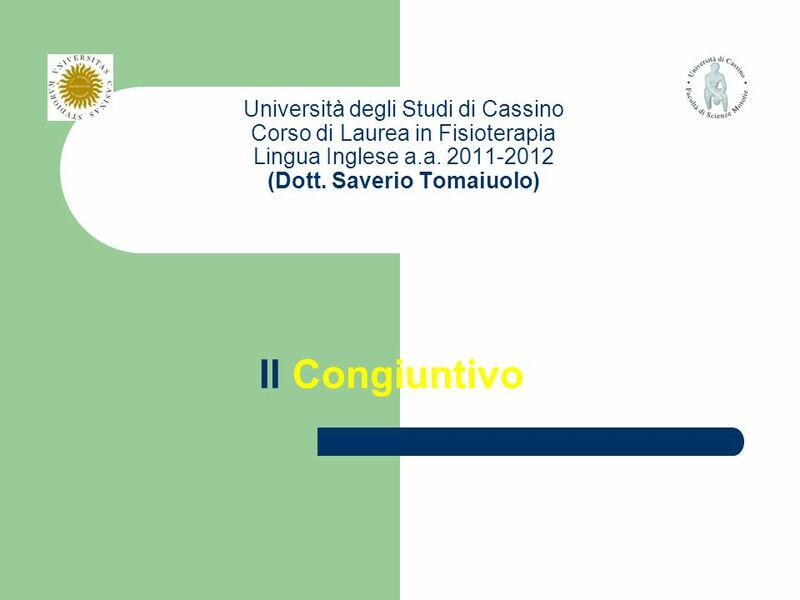 Università degli Studi di Cassino Corso di Laurea in Fisioterapia Lingua Inglese a.a. 2011-2012 (Dott. Saverio Tomaiuolo) Il Congiuntivo. 3 Esempi: I wanted that you came to the stadium. I hoped (that) you didnt do that mistake I wished you were here in that moment. 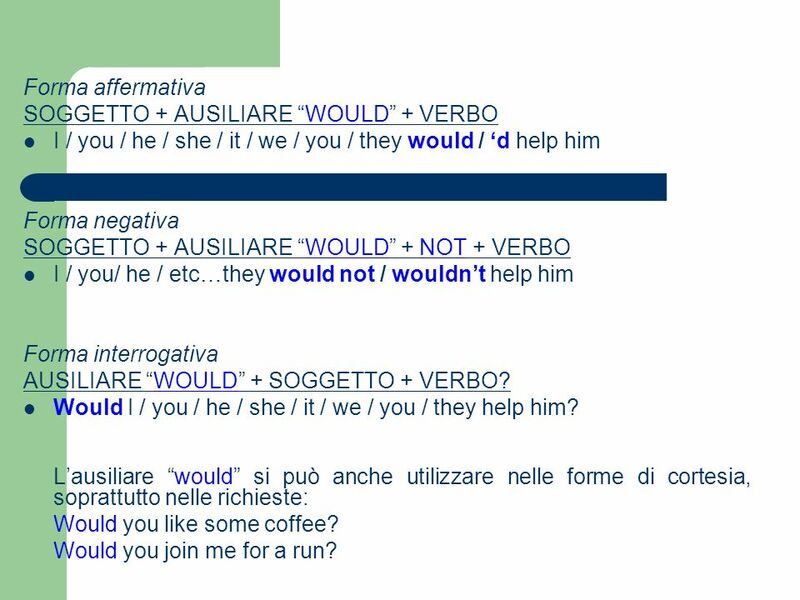 5 Forma affermativa SOGGETTO + AUSILIARE WOULD + VERBO I / you / he / she / it / we / you / they would / d help him Forma negativa SOGGETTO + AUSILIARE WOULD + NOT + VERBO I / you/ he / etc…they would not / wouldnt help him Forma interrogativa AUSILIARE WOULD + SOGGETTO + VERBO? Would I / you / he / she / it / we / you / they help him? Lausiliare would si può anche utilizzare nelle forme di cortesia, soprattutto nelle richieste: Would you like some coffee? Would you join me for a run? 6 Esempi: They wouldnt pass the exam without their help. She would be happy to meet him Would you drink some wine with us? 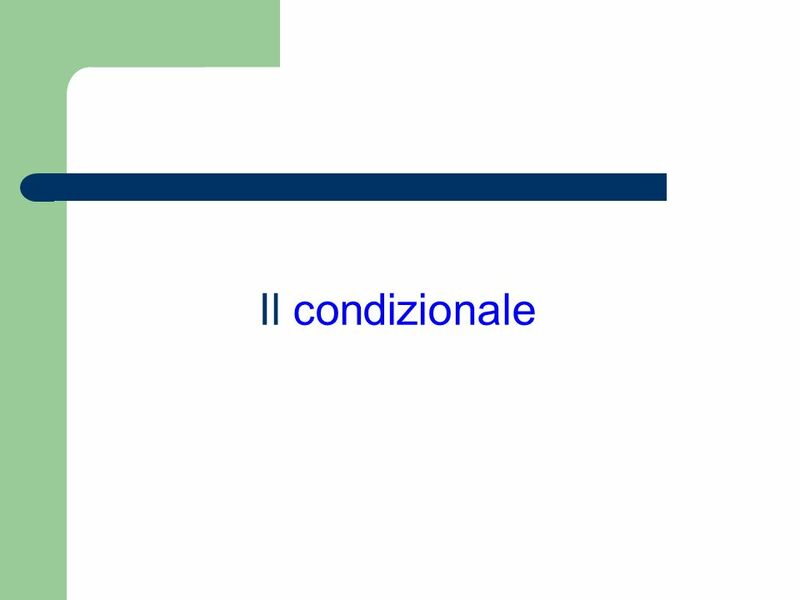 8 Periodo ipotetico di 1° tipo (If-clause n. 1) SOGG. (frase princ.) + WILL // IF + SOGG. (frase sec.) 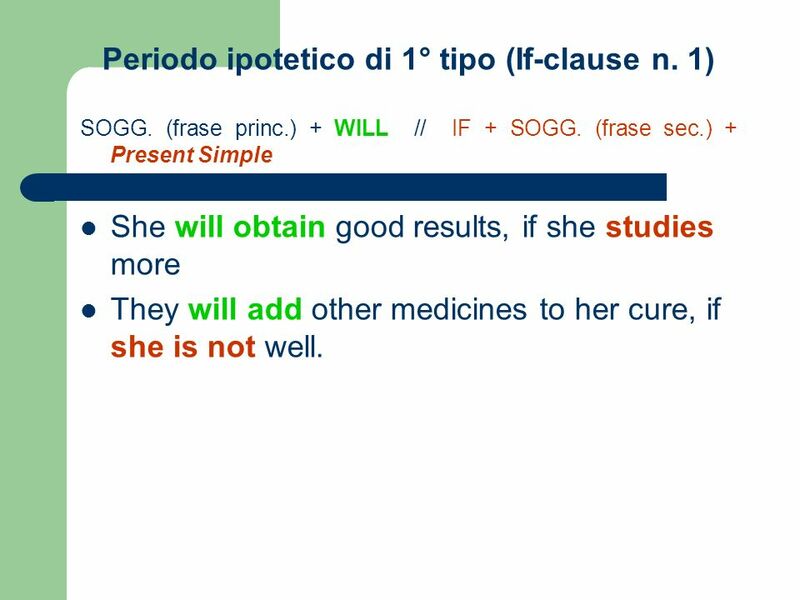 + Present Simple She will obtain good results, if she studies more They will add other medicines to her cure, if she is not well. 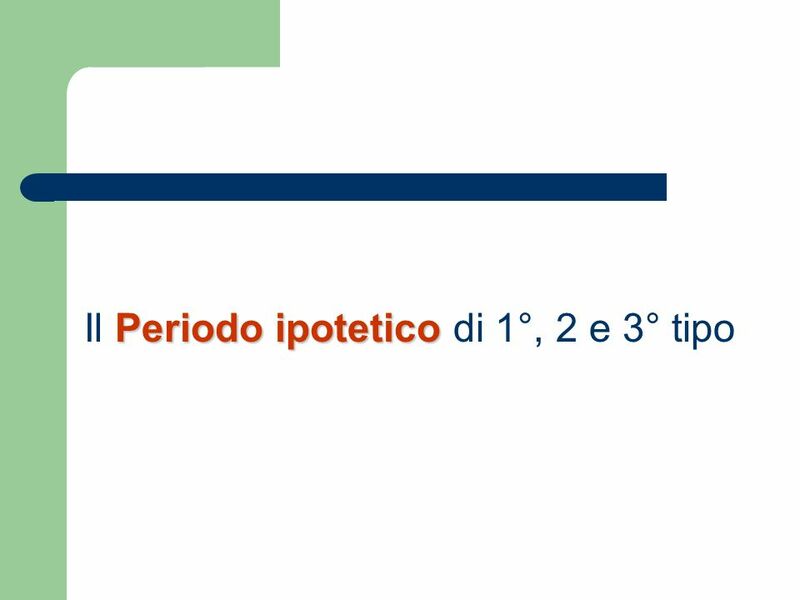 9 Periodo ipotetico di 2° tipo (If-clause n. 2) IF + SOGG. (frase sec.) 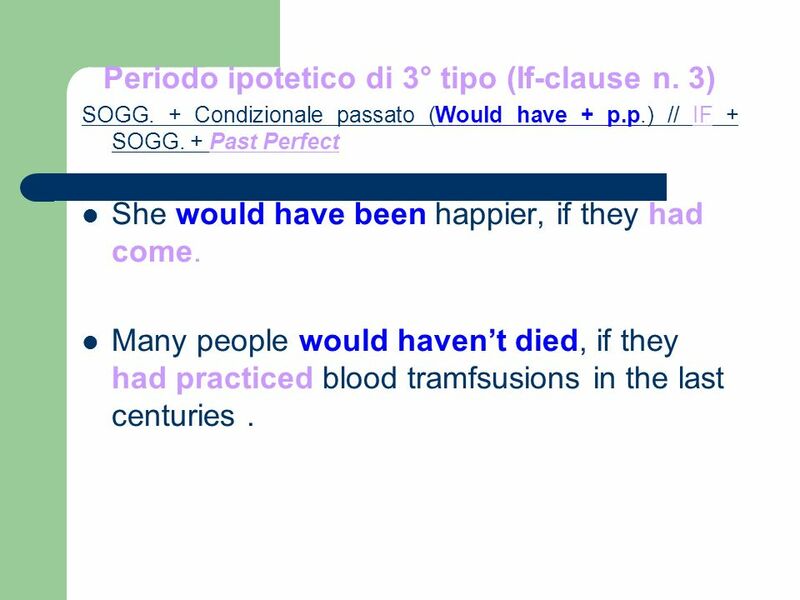 + Past simple SOGG. (frase princ.) + Condizionale Presente // IF + SOGG. (frase sec.) 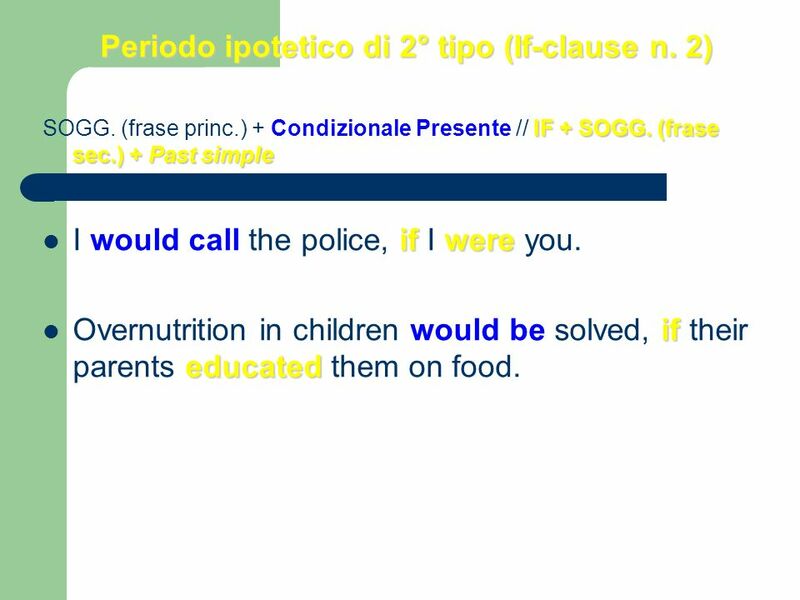 + Past simple if were I would call the police, if I were you. if educated Overnutrition in children would be solved, if their parents educated them on food. 10 Periodo ipotetico di 3° tipo (If-clause n. 3) SOGG. + Condizionale passato (Would have + p.p.) // IF + SOGG. + Past Perfect She would have been happier, if they had come. Many people would havent died, if they had practiced blood tramfsusions in the last centuries. 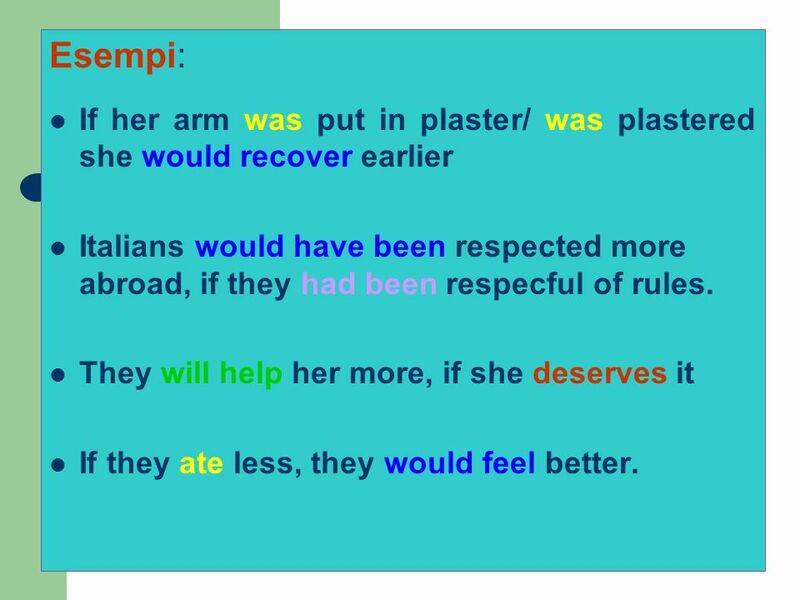 11 Esempi: If her arm was put in plaster/ was plastered she would recover earlier Italians would have been respected more abroad, if they had been respecful of rules. They will help her more, if she deserves it If they ate less, they would feel better. 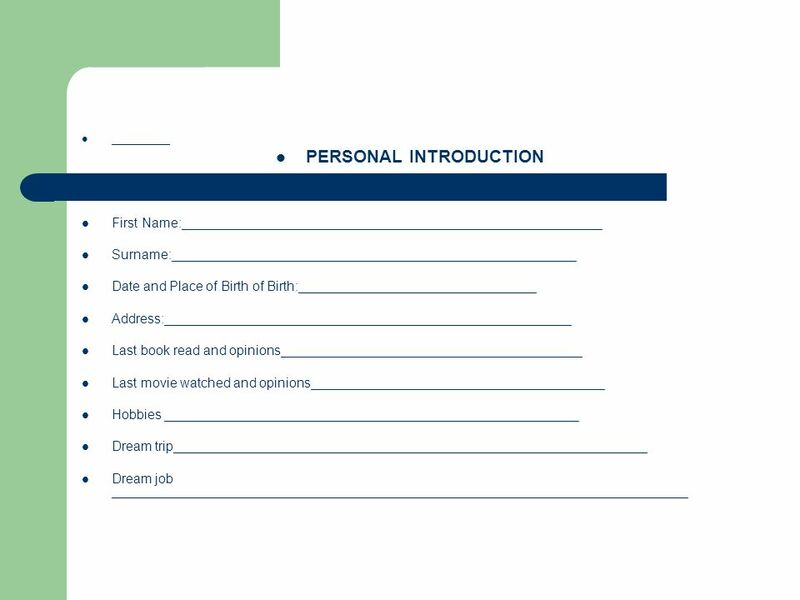 Download ppt "Università degli Studi di Cassino Corso di Laurea in Fisioterapia Lingua Inglese a.a. 2011-2012 (Dott. Saverio Tomaiuolo) Il Congiuntivo." Lexis and Grammar for Translation Dott. M. Gatto Lingue e Culture per il Turismo Lingua e Traduzione Inglese I. Reported Speech. About me... a) Im stupid. I live far from here. I dont live near here. b) Ive been a teacher for a long time. c) I went to the library. Università della Terza Età di Novara LINGUA INGLESE – Base Dott. Raimondi Andrea Welcome to lesson nr. 6 Part 2. 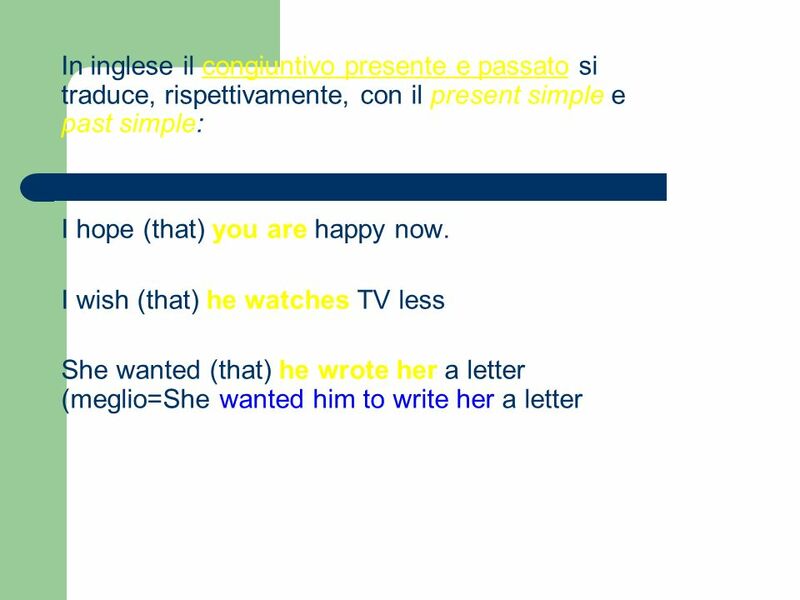 Quando unazione è iniziata nel passato e continua nel presente, in inglese si usa il: simple present perfect past simplepresent continuous. Conditionals; Other Ways to Express Unreality Experiences of an International Traveller 9. Imaginative Conditionals Ron Cowan, Ph.D. PP slides: Yuri Vedrashko November 2006. 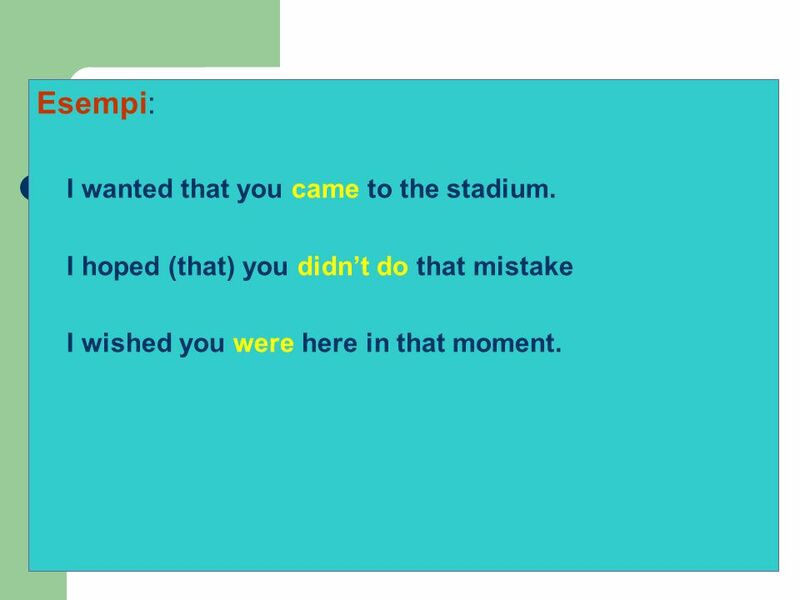 Present tenses: Simple, Progressive (continuous), Perfect. Form 5, unit 4.